They say that “everything old is new again.” Well, that's also true for the double hung sash windows. The double hung sash windows are one of the oldest window designs that offer an energy efficient system, thanks to the state of the art thermodynamic ventilation system. In most cases, the double-hung windows are constructed from an upper sash and a lower sash, with each sash having its glass pane. 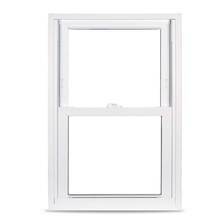 To open or close the double-hung sash window, the lower slide is rolled vertically. For the energy-conscious homeowners, a double-hung sash window from Elkhart Windows in Elkhart, Indiana delivers an eco-friendly option.Even though wood is the most common type of double hung window, modern advancements have led to the use of other premium material such as vinyl, fiberglass, and aluminum. At Elkhart Windows in Elkhart, we are an all-inclusive firm that caters to all your double-hung sash window needs. So whether you've customized your home, have a big house, small house, contemporary, traditional or have a unique window shape, we've got you covered. We have an array of double hung windows sizes that can fit any shape or size. Another common hung ash window material that has gained prominence over the past few years is the vinyl double-hung. Unlike the wooden sash, the vinyl sash is extremely energy efficient thanks to the Low-E glass and inert gas between the panes. Also, the material does not need regular maintenance or painting and is more resistant to water damage than wooden windows. To make choosing the right Double hung windows easier, you can use our Double hung windows size chart-a catalog that contains all Elkhart Windows standard sizes for windows. These performance rated double hung windows are all the window shapes, and sizes that are readily available on our premises. However, should you require a customized window, it's not a problem. We will work with you to ensure that we deliver a tailor-made solution that meets all your demands, and will be delivered and installed at your convenience. Typical hardware for the double hung window includes sash that is fastened to the bottom, even though they're sometimes eliminated by providing a finger groove in the rail. For this reason, the windows are quite hardy and have a lifespan of 15-25 years. Also, they've a locking system that bolsters the windows against heavy winds, storms, and snow. Many homeowners soften hesitate to replace their house window for fear it will alter the original look and aesthetics of the home. With double hung windows from Elkhart Windows in Elkhart, Indiana, you can easily maintain your home's original look or can even add new interests to your interior or exterior. For maximum beauty, our professionals can differentiate the frame finish on the inside from what is on the outside.